We should all pay our fair share of taxes. In an age of austerity and spending cuts, tax avoidance is morally unacceptable: Tax dodging costs lives. It effectively amounts to robbing from the poor – both in the UK and in poor countries – of the money that should be spent on education, health and welfare. 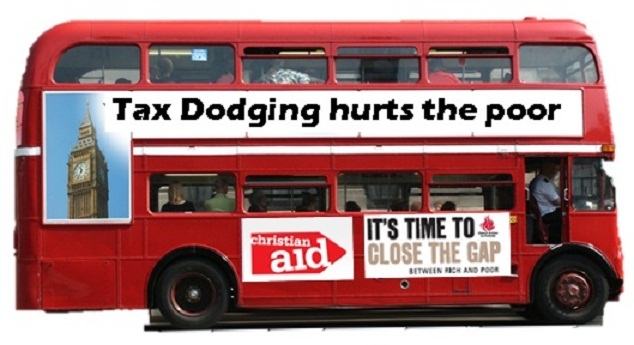 This is why Christian Aid and Church Action on Poverty are joining forces this autumn to take the campaign for Tax Justice on the road for a seven week Tax Justice Bus Tour. A bright red double-decker Tax Justice bus will be touring the length and breadth of Britain and Ireland, to promote the simple message: Its time for Tax Justice for the poorest communities at home and globally. Corporate tax dodging, mainly by big business, costs the UK taxpayer up to £100 billion per annum. And Christian Aid estimate that US$160bn of revenue is being denied to developing countries every year by unscrupulous multinational corporations that use tax haven secrecy to dodge taxes. Imagine the difference US$160bn a year would make to the fight against world poverty: to health, education, sanitation, clean water and other services in the world’s poorest countries. It could fund the United Nations’ Millennium Development Goals several times over, eradicate malaria and other deadly diseases, or it could help to build people’s resilience to ever more frequent drought and floods in the face of climate change. Imaging the difference even £30 billion a year would make to the fight against poverty close to home: to reduce (or even eliminate) the need for further cuts in spending on public services, care for the elderly, libraries, schools, youth centres, or cuts to benefits for families, disabled people, people suffering long-term illness or incapacity. Tax dodging is big business, and tax havens lie at the heart of the global economy. 98 of the UK’s top 10 largest corporations operate subsidiary companies in ‘offshore’ tax havens, potentially allowing the companies and their clients to avoid huge sums in tax. More than half of world trade – at least on paper – passes through tax havens. More than half of all banking assets and a third of multinational company investments are routed via tax havens. In 2010 the International Monetary Fund estimated that the money on the balance sheets of small island tax havens alone amounted to US$18tn – about a third of the world’s financial wealth. Tax dodging and tax secrecy is anti-social behaviour on a global scale. It is time for the UK to take a lead in stopping unscrupulous firms dodging tax. But, to borrow a phrase from Jim Wallis, this requires us to ‘change the wind.’ Our task is to be ‘windchangers’ – to shift the public mood from turning a blind eye to the tax dodging activities of our biggest corporations and accounting firms, to making tax avoidance as morally (and legally) unacceptable as stealing from the poor. This might seem an impossible task, in the face of powerful vested interests who want to maintain the status quo. But the campaign to Close the Tax Gap has already made progress. In recent years companies such as Play.com, Tesco and Amazon have been shipping DVDs and CDs sold on-line via companies based in the Channel Islands, solely to avoid paying VAT. Rather helpfully, Tesco’s own website even explained why this was the case. Following representations from church leaders and over 700 emails to the Chancellor from supporters of our Close the Tax Gap campaign last autumn, the Government announced that it was going to close the loophole from the beginning of April. A small success, in relation to the scale of global tax dodging, but an illustration of the ability of ordinary people in churches to change the wind. So look out for the bright red Tax Bus this autumn. Help us build support for Tax Justice with churches, politicians and fellow travellers across the country and together we can change the wind. All aboard for Tax Justice!